Summary: Nimira is a music-hall performer forced to dance for pennies to an audience of leering drunks. When wealthy sorcerer Hollin Parry hires her to do a special act - singing accompaniment to an exquisite piano-playing automaton, Nimira believes it is the start of a new life. In Parry's world, however, buried secrets stir. 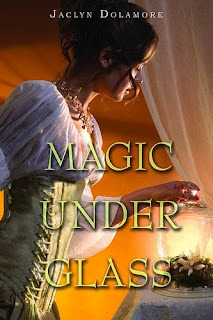 Unsettling below-stairs rumours abound about ghosts, a mad woman roaming the halls, and of Parry's involvement in a gang of ruthless sorcerers who torture fairies for sport. When Nimira discovers the spirit of a dashing young fairy gentleman is trapped inside the automaton's stiff limbs, waiting for someone to break the curse and set him free, the two fall in love. But it is a love set against a dreadful race against time to save the entire fairy realm, which is in mortal peril. part wanted her to end up with Hollin. I've heard it both ways from other people as well. The historical part of this book didn't bother me at all (I usually do not like too many historicals). What happens with the automation, what happens to Nim and Hollin? Does she stay or does she go? Read the book now to find out. Overall: I was really looking forward to reading this for a while, and I'm glad I did so soon. It is a wonderful written book and I hope there is a book 2! Cover: The cover is alright. I like her hair and the way she is turned. It does look like a historical cover, yet it is cute enough to make you want to give the book a second glance.